This luxury hotel features 2 restaurants 2 swimming pools on-site Chocolatier and its own cigar company. Graycliff Hotel is a restored mansion from 1740 and overlooks the Government House.The Graycliff offers air-conditioned rooms with free WiFi and most of them overlook the surrounding gardens. 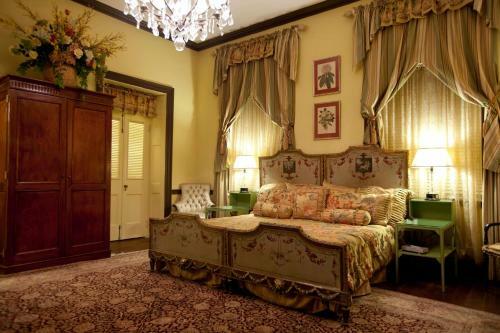 The rooms are decorated in tasteful decor with a European rich feel with rich tapestries and comfortable amenities.The Humidor Churrascaria Restaurant serves stylish Brazilian-cuisine and meat cuts while the winery offers bottles from over 15 countries. Guests can also visit the Graycliff Cigar Company. There is a wine cellar the 3rd largest private collection in the world with over 250000 bottles in the collection and some of the finest wines in the world.Located on the old part of Nassau Graycliff Hotel is 13 km from the Lyndon Pindling International Airport and 4-minutes’ drive from the National Art Gallery. discover all that Nassau can offer you!